FlexiRents is the final year project by Preet Panesar from DS17 (architecture and film design studio) at University of Westminster. 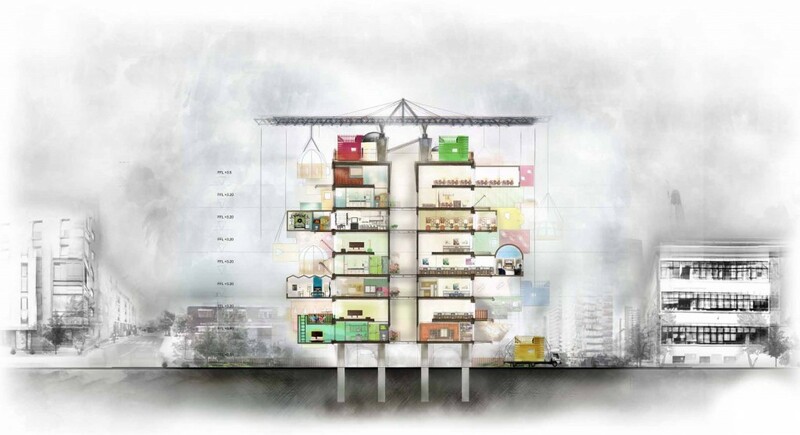 The scheme explores adaptable live/work housing solutions. I began by addressing a common flaw found in modern urban housing, such as dense terrace housing, flats and apartments. These typologies fail to accommodate the constant change in people’s circumstances. Having been born and brought up in London, I have had firsthand experience with space negotiations in the home. Being one of seven living in a three bedroom house it never felt like a tight squeeze yet we all constantly fought for our ‘own’ space. With the regular arrival of guests and visitors we would often feel like we had reached the house’s maximum capacity. Yet space was always found somewhere, beds were shared, floors doubled up as mattresses and we managed. As we changed and grew, the house also grew and saw dramatic changes. We added an extension to our kitchen to provide more living space, we had a loft extension to make our 3 bedroom house a four bedroom, and at one time we also partitioned the master bedroom to carve out an extra space. These processes seen diagrammatically are very common changes that take place throughout London to typical terrace homes. Yet in Bermondsey (our given site for exploration) , where the main housing typology is an estate flat, the space for expansion is minimal and most likely nonexistent. Yet high density high rise seems to be the planners/governments solution to the housing crisis, where there is no room for expansion within the typology. Moreover, extensions such as those done in a house cannot be done as easily in a housing block. My design involves providing a core unit of space which can expand and contract over time as ones needs change. The expansion is carried out using a giant sliding gantry crane on the roof of the building and a series of add-on rooms that can be attached on to the facade or carved into the space within. These rooms range from balconies and conservatories to spare bedrooms and meeting rooms. The Building is lifted on columns that open up the ground floor. The space below will be used as workshops by local labour to fit out and maintain the add-on spaces. 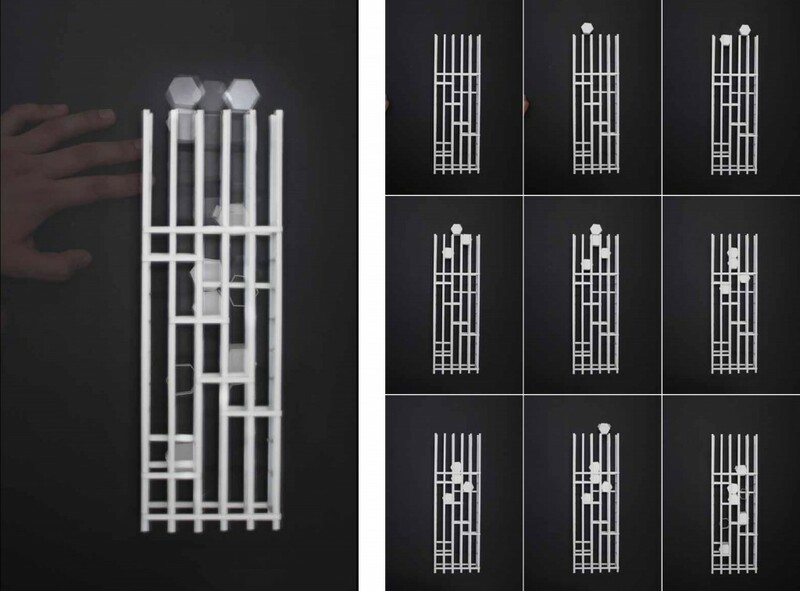 The final proposal is a study of two typologies, a vertical tower and a horizontal block. The Work Space is provided along the north of the site whereas the south facing rooms all belong to the Residential Units. 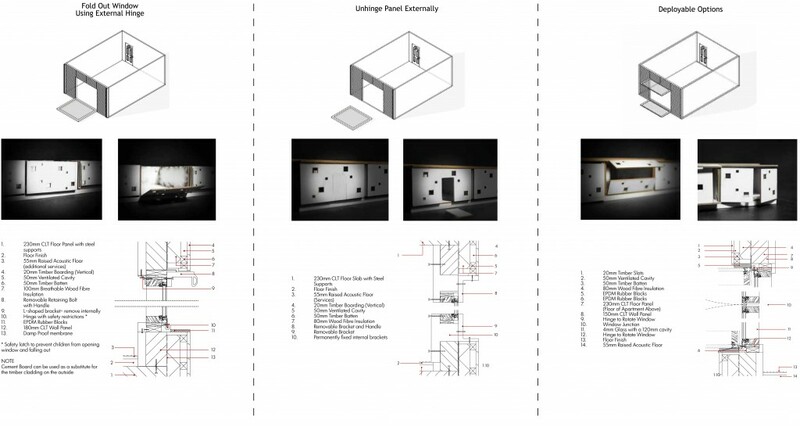 The individual units have been designed with partitions enclosed within the existing walls. These can unfold and click out to form divisions of space internally . The Add- On spaces are designed to accommodate different internal functions, clients can also order custom made add ons. 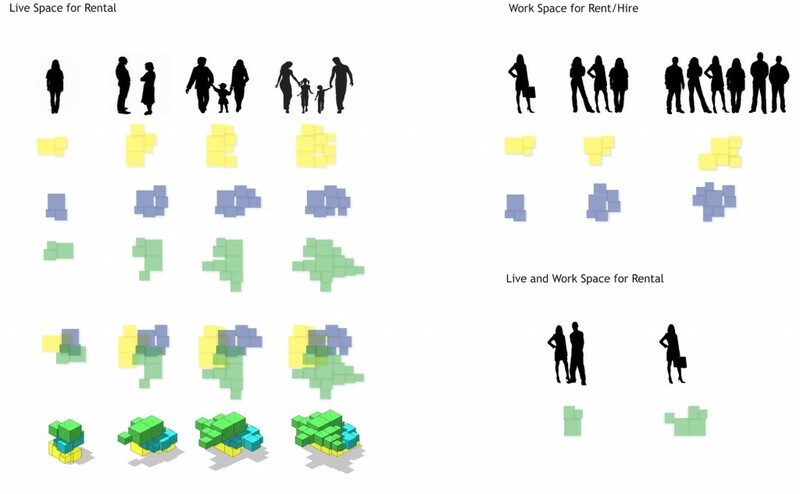 By designing these flexible Live/Work spaces in this way, the aim is to encourage integration between the various members of the community that live and/or work in the building.This is achieved as spaces would need to be constantly negotiated and compromises would need to be made regarding allocation of additional rooms and who takes what space and for how long.